Ramaphosa: Trade unionist president or capitalist sell out? A unionist ponders. 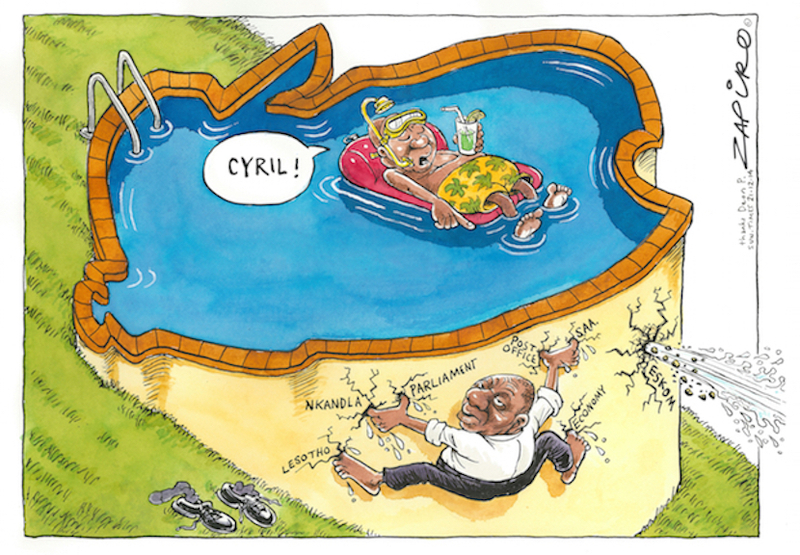 How Zapiro views Deputy President Cyril Ramaphosa’s current role. More of his magic available at www.zapiro.com. With Deputy President Cyril Ramaphosa standing a good chance of becoming the country’s next President, I recall my first impressions of Ramaphosa when I, as a young public servant, saw him in action when he was chairman of the Constitutional Assembly. It was after the election in 1994, at the beginning of the next phase of the democratic process to draft the country’s new constitution. Ramaphosa, who was the first general secretary of the National Union of Mineworkers (NUM), was a highly experienced union negotiator and the ideal person for the ANC to act as chairman of the Constitutional Assembly following his negotiating role at Codesa, with Leon Wessels as an inexperienced negotiator at his side as deputy chairman. As a junior official in the Department of Constitutional Development, my role was to sit in the rear corner of the venue where negotiations on the content of the new constitution were taking place, making notes and doing research on everything of direct importance to the department. At 07:00 every morning, Roelf Meyer, then Minister of Constitutional Development, was briefed by my seniors on the negotiations of the previous day, but I could not take part because I was at the bottom rung of the ladder. Day in day out I watched how the ANC negotiators wiped the floor with the National Party’s inexperienced negotiators and how Ramaphosa as the “neutral” chairman was calling the tune and determining the direction of every debate. He also gave strategic inputs from the chair, always guiding the ANC negotiators in the desired direction. When the ANC was under pressure, he would quickly indicate that it was time for a break and then he would disappear with the ANC delegation, and after the break the ANC would be back with renewed vigour. At some stage a junior colleague, also fresh from university with a degree in economics, joined me to focus on all the economic issues. So there my colleague Robyn and I were sitting in our corner every day watching how the charismatic Ramaphosa with a wonderful sense of humour was wielding the sceptre, and we two juniors were amazed that nobody realised that Ramaphosa from the chair was in fact the ANC’s chief negotiator. The two years’ experience in the Constitutional Assembly motivated me to decide on a new field of study and career so I could also get a job where I could negotiate. 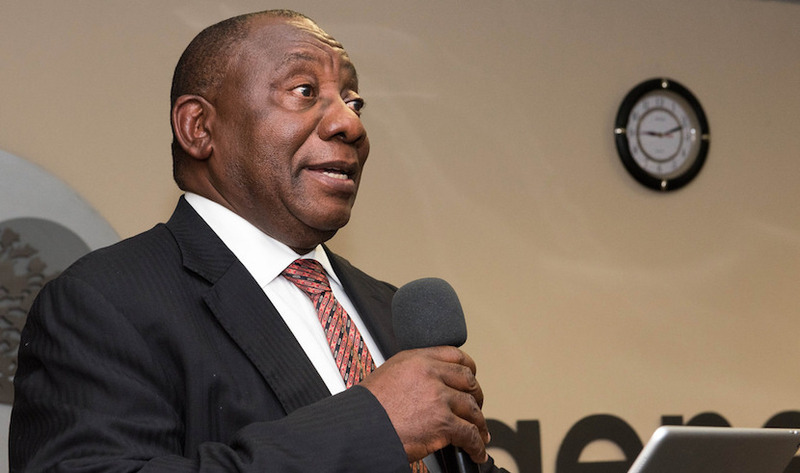 Now, two decades later, the same Ramaphosa again has an opportunity to wield the sceptre and that in a more powerful position, but his image has been somewhat tarnished in the meantime. This former socialist union leader has since acquired unheard-of wealth by means of sometimes dubious business transactions landing in his political lap, which is a concern. There have been reports about an extramarital relationship and stories about him and young girls. (These stories disappeared from the media as quickly as they appeared.) Then there is the huge EFF millstone round his neck – the controversial email he, a Lonmin shareholder at the time, sent on 15 August 2012 requesting that the protesting Lonmin workers and community members sitting on the Marikana hill be called to order by the police. If Ramaphosa becomes President, the EFF slogan in parliament of “pay back the money” that was aimed at President Zuma will be replaced by “Marikana murderer”, where Ramaphosa this time will be at the receiving end. The NUM and the besieged mining house Lonmin, on whose doorstep the Marikana tragedy unfolded, will, however, be pleased if “their man” could fill the highest office, hoping that he could give them a new lease of life. But it would amount to political suicide for Ramaphosa to openly get involved with Lonmin and NUM, because Amcu, having violently ousted its arch enemy, NUM, at Lonmin, has close ties with the EFF, and Ramaphosa would prefer to neutralise these two “enemies” to his left. Ramaphosa the strategist will not make the mistake of alienating Amcu and the EFF. This is the type of intervention that forms part of Ramaphosa’s skills set. The aversion of the Amcu president, Joseph Mathunjwa, to Ramaphosa goes beyond the latter’s Marikana stigma. It can be traced back to 2001, when Mathunjwa was dismissed by Ramaphosa’s successors in NUM. If ever Ramaphosa and Mathunjwa would discuss reconciliation, they at least will have one thing in common in that Ramaphosa in 1987 was at the helm of the country’s biggest gold mine strike and Mathunjwa was the architect of Amcu’s record five-month long platinum strike in 2014. The bloody rivalry between Amcu and NUM has already resulted in more deaths than the 34 people who died in the Marikana massacre. In addition, we are also experiencing a mining industry retrenchment bloodbath and high tension among role-players over the controversial mining charter. Thanks to Ramaphosa’s proven record as mediator in local and international conflict situations, he is the man who can save the important mining sector. And whoever are going to be the Ministers of Finance and of Public Service and Administration early next year, will rely heavily on Ramaphosa’ experience when it comes to salary negotiations in the public service, which are heading for a strike. With Ramaphosa’s initial expertise as union leader, it became clear that the trade union environment was a comfort zone. For example, he was instrumental in the recent Nedlac negotiations regarding a minimum wage and revised strike legislation. It was also Ramaphosa who jumped in four years ago when the tensions within Cosatu reached breaking point, but he was unable to prevent the trade union from being torn apart because the conflict was fundamentally about support for Zuma. Ramaphosa as president will be able to mend the government’s fragile relationship with Cosatu and there is no doubt in my mind that he will try to reconcile Zwelinzima Vavi’s new federation, Saftu, that split away from Cosatu, with Cosatu to regain the ANC’s support base among the workers from the EFF. Thanks to Ramaphosa’s background, he also understands the value of social dialogue and he knows that an inclusive approach defuses tensions. 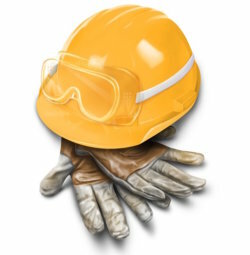 With the majority principle of trade union recognition that is on the increase at Nedlac, and especially the mining industry, Ramaphosa’s grasp of pluralism will hopefully also spill over into the labour relations field, and under Ramaphosa, the undemocratic majority principle will hopefully be phased out in order to normalise labour relations in the country. Although Solidarity stands outside of party politics, and although its values don’t always coincide with those of Ramaphosa, his presidency will actually be beneficial for Solidarity. A number of years ago, Ramaphosa was guest of honour at a function hosted by Lonmin, and on arrival he first wanted to greet the trade unions. I introduced myself to him and told him of my observations at the Constitutional Assembly all those years ago. At first Ramaphosa, with a big smile, denied that he had abused his powers as chairperson in any way, and then he started telling amusing stories about his experience with the former Mineworkers Union, and how he now had the highest regard for Solidarity’s positioning and influencing public opinion. As we all do, Ramaphosa has his faults and a few more skeletons may start jumping out of the cupboard with the election just around the corner, and sometimes he makes disturbing populist and peculiar ideological statements, but Ramaphosa is still the best candidate in terms of understanding business, trade unionism, political leadership and effective governance. He should also be able to make better cabinet appointments and clamp down on poor achievers, placate credit rating agencies, attract investors back to the country (because that was one of the reasons why Zuma succumbed to pressure to appoint him as deputy president at that time). What is very important, is that he will be able to defuse the tensions in the mining sector and unite militant trade unions and trade union federations under a common goal. Should Ramaphosa become president, may the good leader in Ramaphosa lead us. 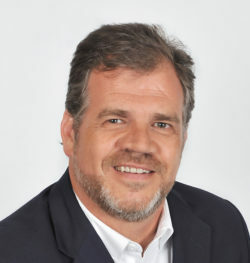 Gideon du Plessis is Solidarity’s General Secretary.